In recent years, the use of biologically inspired methods such as the evolutionary algorithm have been increasingly employed to solve and analyze complex computational problems. BELBIC(Brain Emotional Learning Based Intelligent Controller) is one such controller which is proposed by Caro Lucas, Danial Shahmirzadi and Nima Sheikholeslami and adopts the network model developed by Moren and Balkenius to mimic those parts of the brain which are known to produce emotion (namely, the amygdala, orbitofrontal cortex, thalamus and sensory input cortex). Every creature has innate abilities that accommodate its survival in the world. It can identify food, shelter, partners, and danger. But these “simple mappings between stimuli and reactions will not be enough to keep the organisms from encountering problems.” For example, if a given animal knows that its predator has qualities A, B and C, it will escape all creatures that have those qualities. And thus waste much of its energy and resources on non-existent danger. It has been suggested that learning takes place in two fundamental steps. First, a particular stimulus is correlated with an emotional response. This stimulus can be an endless number of phenomena from observing a face, to detecting a scent, hearing a noise, etc. Second, this emotional consequence shapes an association between the stimulus and the response. This analysis is quite influential in part because it was one of the first to suggest that emotions play a key part in learning. 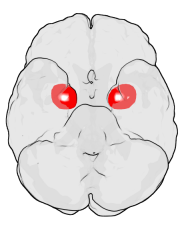 In more recent studies, it has been shown that the association between a stimulus and its emotional consequence take place in the amygdala. “In this region, highly analyzed stimulus representations in the cortex are associated with an emotional value. Therefore, emotions are properties of stimuli”.